A man working two jobs to make ends meet is pushing 40 and thinking a lot about rhinos. The man is Jeremy Taylor and he has decided to donate his middle-age milestone to rhinos. "Rather than just spending my 40th thinking, 'ugh, I'm 40,' I wanted to put a positive spin on it," Taylor told The Dodo. "Sure, I could ask for money to help pay for my week in Maine this summer, or for the new camera I want to get, but this birthday, I want to help save rhinos!" Taylor wrote on his fundraising page. 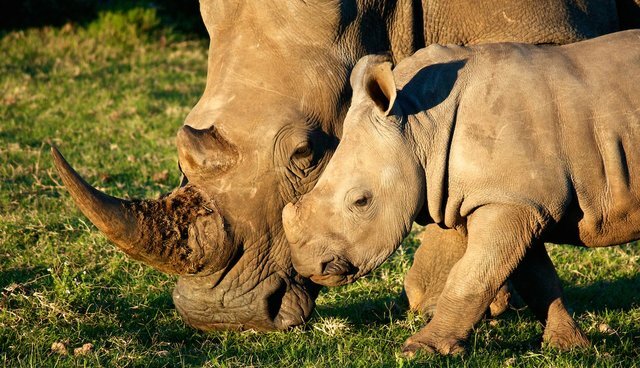 "These magnificent creatures are facing extinction within my lifetime [...] if something is not done, and I don't want to think of a world without rhinos." Taylor, who now works as an environmental educator during the week and a cashier during the weekend, has also been a bird keeper in Disney's Animal Kingdom, where he was able to get up close to the endangered rhino. Since then, Taylor has been fascinated by the animals, and now believes wild animals should not be held captive for human entertainment. "I'm just not a fan of that," he said. When he read about Sudan, the last male Northern white rhino at Ol Pejeta Conservancy a few months ago, Taylor decided he needed to take action. 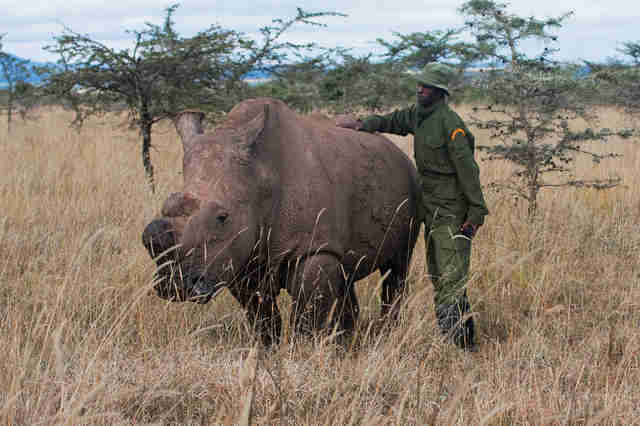 Sudan is guarded 24 hours a day because there is no one else like him left on earth. Coincidentally, Sudan is also 40 years old. Rhinos are endangered because their horns rake in huge amounts of money in Asia, where they're believed to cure a range of ailments. Taylor hopes his 40th birthday can help fund conservation efforts like Ol Pejeta's for these majestic animals who have been brutally slaughtered for a ridiculous superstition, bringing their numbers from 500,000 at the beginning of the 20th century down to fewer than 30,000 today. Taylor spends much of his free time thinking about animals and the planet. He started the Earth Survey Project in 2006, which seeks to understand how people relate to the natural world. In engaging people from around the globe to answer questions about their relationship to our planet, Taylor hopes to ultimately encourage active participation in helping to save it. Taylor has gotten over 700 responses to his online survey, according to the Earth Survey Project's Facebook page, ranging from scientists and environmentalists to religious leaders, schoolchildren and villagers in Nairobi. "I may never have a chance to travel to see these magnificent animals in the wild," Taylor said in a statement. "But if I do, I hope that there are still some left to see!" Taylor turns 40 on July 18th. We hope more people donate their birthdays to animals. Learn more about giving a gift to rhinos in honor of Taylor's 40th birthday here. Take Taylor's survey about your relationship to planet Earth here.